An Advent calendar is a special calendar used to count the days of Advent in anticipation of Christmas. Since the date of the First Sunday of Advent varies, falling between November 27 and December 3 inclusive, many Advent calendars, especially those that are reusable, often begin on December 1, although those that are produced for a specific year often include the last few days of November that are part of the liturgical season. 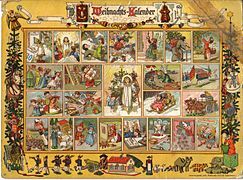 The Advent calendar was first used by German Lutherans in the 19th and 20th centuries. Traditional Advent calendars feature the manger scene, Saint Nicholas and winter weather, while others range in theme, from sports to technology. They come in a multitude of forms, from a simple paper calendar with flaps covering each of the days to fabric pockets on a background scene to painted wooden boxes with cubby holes for small items. 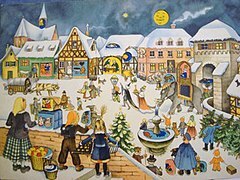 Many Advent calendars take the form of a large rectangular card with "windows", one for each day of December leading up to and including Christmas Eve (December 24). Consecutive doors are opened every day leading up to Christmas, beginning on the start of the Advent season for that year, or in the case of reusable Advent calendars, December 1. Often the doors are distributed across the calendar in no particular order. The calendar windows open to reveal an image, a poem, a portion of a story (such as the story of the Nativity of Jesus), or a small gift, such as a toy or a chocolate item. Often, each window has a Bible verse and Christian prayer printed on it, which Christians incorporate as part of their daily Advent devotions. Advent calendars may also have puzzles and games printed on their reverse side. The long-established British magazine Country Life incorporates an Advent calendar—which it describes as "our famous Advent calendar"—in its cover for the final issue of November. There are many variations of Advent calendar, including social media Advent calendars, and string up reusable Advent calendars. 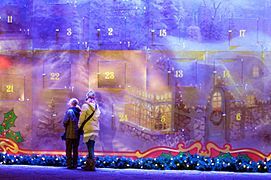 Many towns have created living advent calendars. Some Advent calendars even eschew traditional Christmas motifs and themes, focusing only on Jesus as the central character of the Christmas story. In Denmark, Finland, Iceland, Norway and Sweden there is also a tradition of having a so-called Julekalender (Swedish: Julkalender, Finnish: Joulukalenteri, Icelandic: Jóladagatal; the local word for a Yule—or Christmas—calendar, even though it actually is an Advent calendar) in the form of a television or radio show, starting on December 1 and ending on Christmas Eve (December 24). Such a show first aired on radio in 1957 in the form of the Swedish radio series Barnens adventskalender; the first televised show of the genre aired in 1960 in the form of the Swedish program Titteliture. The first julekalender aired in Denmark was Historier fra hele verden in 1962. The televised julkalender or julekalendar has now extended into the other Nordic countries; in Finland, for example, the show is called Joulukalenteri. Over the years, there have been several kinds of julekalender; some are directed at children, some at both children and adults, and some directed at adults alone. There is a Julkalender radio show in Sweden, which airs in the days leading up to Christmas. A classic example of a julekalender enjoyed by children (as well as adults, if purely for nostalgic reasons) is the 1979 Norwegian television show Jul i Skomakergata; another is the 1990 Icelandic television show Á baðkari til Betlehem. Advent calendar from Im Lande des Christkinds. The windows contain Christmas poems. Images, from a cut-out sheet, were pasted over them. A 1946 Advent calendar by Marianne Schneegans [de]. 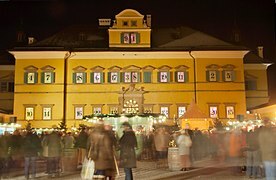 The 24 windows of the front of Hellbrunn Palace in Salzburg, Austria used as an Advent calendar during the town's Christmas market. A home-made Advent calendar featuring presents. An Advent calendar consisting of images that have dates on the inverse side. A home-made Advent calendar made from wood in the shape of a Christmas tree. Advent Calendar at the City Hall in Stollberg, Saxony. Two girls try to open a massive Advent calendar at the Kaiser Wilhelm Memorial Church, Berlin. Advent calendar with real living people. ^ Penney, Sue (1999). Christianity. Heinemann. p. 38. ISBN 9780435304775. In Advent, Christians use special candles and calendars. Advent candles have marks to show the days until Christmas. The candle is lit each day until it burns down to the next mark. Advent calendars have little doors to open, one for each day. Behind each door is a picture. Candles and calendars like this help to remind people that Christmas is coming closer. ^ a b "Online Advent calendar created by the world". Anglican Communion News Service. November 17, 2016. Archived from the original on December 20, 2016. Retrieved December 8, 2016. ] Christians across the world are being invited to celebrate the season of Advent through an interactive, multi-lingual online calendar. The website adventword.org goes live on Advent Sunday (27 November) in nine languages including, for the first time, Arabic. It allows people around the globe to create together an advent calendar with images shared by their mobile phones. Advent, which runs from Sunday 27 November to Christmas Eve, is the season when Christians prepare to celebrate the birth of Jesus. It is traditionally marked with the putting up of an Advent calendar to count down the days. The calendars have daily windows which are opened to reveal images, small chocolates or other gifts. ^ a b Mac Donald, Sarah (November 26, 2014). "Primate launches online calendar for Advent". Catholic Ireland. Archived from the original on April 26, 2016. Retrieved December 8, 2016. The Primate of All Ireland, Archbishop Eamon Martin, on Tuesday launched a specially commissioned 2014 Advent calendar to coincide with the beginning of Advent on Sunday 30 November. The online calendar can be found on the Irish Catholic bishops' website www.catholicbishops.ie. This year's calendar also incorporates a new feature in the form of an audio 'Thought for Today'. In a statement, the Archbishop said "Each day of Advent amounts to a period of time which allows us to journey and reflect on 'the joy of the Gospel." “As Advent is the season of preparation for the coming of our Lord, I encourage the faithful, notwithstanding our hectic schedule over the coming weeks, to make time to pray – alone and with loved ones – and by so doing to draw nearer to Christ," Archbishop Martin encouraged. The first door on the Advent Calendar will open on Sunday next 30 November and each subsequent day after that. ^ a b Mills, T.J. (May 10, 2010). The Twelve Blessings of Christmas. Thomas Nelson Inc. p. 54. ISBN 9780529124319. 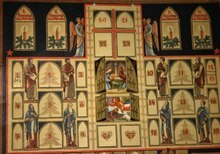 The Advent calendar was first used by Lutherans in the early 19th century. Early printed Advent calendars had Bible verses behind little cardboard doors. ^ a b Gassmann, Günther; Larson, Duane H.; Oldenburg, Mark W. (April 4, 2001). Historical Dictionary of Lutheranism. Scarecrow Press. p. 87. ISBN 9780810866201. The periods of Advent and Christmas have been especially dear to Lutherans and have provided ground for the creation and observation of customs: the rich tradition of hymn singing and church music, the Advent wreath as a sign of Christ's victory, the Advent calendar with its "windows," candles symbolizing new light in darkness, the varieties of Advent and Christmas cookies (gingerbread, fruit loaf, and so on) with several spices (originally seven, the holy number), the Christmas tree with glittering decoration and self-made figures and symbols as a reminder of the gold and treasures that the three wise men brought to the Christ Child, the cribs and tableaus within and out front of the churches and houses, and the greeting of Christmas morning by hymns and carols blown by trumpets and trombones from church towers. ^ MacBeth, Sybil (November 1, 2014). The Season of the Nativity. Paraclete Press. p. 50. ISBN 9781612616131. The variety of Advent calendars is endless, and they are available online, in bookstores, and even in some grocery stores. The "old-fashioned," meaning twentieth-century and earlier versions, are made of paper and often include pictures of Santa Claus, the manger, or winter weather. Most calendars have twenty-four little paper doors; behind each is a picture or a Bible passage. ^ Black, Vicki K. (January 9, 2004). Welcome to the Church Year: An Introduction to the Seasons of the Episcopal Church. Church Publishing, Inc. p. 17. ISBN 9780819225757. The Advent Calendar: Another way to mark the progress of Advent is the Advent calendar. Again, many children enjoy this hands-on way of keeping Advent, and families can incorporate prayers and brief Scripture readings or nativity stores into the daily ritual of opening the Advent calendar. ^ "Names of Jesus Advent Calendar". ^ "Julkalendern 50 år - Bakgrund". Web.archive.org. December 10, 2007. Archived from the original on December 10, 2007. Retrieved December 9, 2011. Taylor, Alan (November 30, 2012). "2012 Hubble Space Telescope Advent Calendar". In Focus. The Atlantic. Taylor, Alan (December 1, 2018). "2018 Hubble Space Telescope Advent Calendar". In Focus. The Atlantic. "Advent är mörker och kyla"
"Come, thou Redeemer of the earth"
"Come, Thou Long Expected Jesus"
"Es ist ein Ros entsprungen"
"The Holly and the Ivy"
"Jesus Christ the Apple Tree"
"Lo! He comes with clouds descending"
"Maria durch ein Dornwald ging"
"Nun komm, der Heiden Heiland"
"O Come, O Come, Emmanuel"
"O Heiland, reiß die Himmel auf"
"O How Shall I Receive Thee"
"Of the Father's Heart Begotten"
"Savior of the Nations, Come"
"Sei uns willkommen, Herre Christ"
"There is no rose of such virtue"
"Vi tänder ett ljus i advent"
"Hark, a Thrilling Voice Is Sounding"
"Wachet auf, ruft uns die Stimme"
"Old Santeclaus with Much Delight"
This page was last edited on 5 January 2019, at 01:54 (UTC).